Last week I went with Donna and Gretchen on a road trip.They are both teachers, so they have vacation for the Easter holiday. I was a teacher once-upon-a-time and I remember how I loved those school vacations. We wanted to take full advantage of the time so we headed to Lafayette and The Village of River Ranch. River Ranch is a traditional neighborhood development and is a mixture of residential and retail blended with recreational areas accented with beautiful landscaping. It’s a town within the town of Lafayette located in the middle of Acadiana. The area has huge mansions, “regular” homes, garden homes, condominiums and apartments. There are also restaurants and shops all within walking distance of each other. There is a huge “City Club” that is for the use of the residents. The City Club offers a fitness center, a spa, and recreation for the kids, too. We chose to have lunch outside of River Ranch at Chris PoBoys. Upon entering we saw that it is obviously patronized by many of the Lafayette locals. We did not have to wait for a table because we were early, but as we left the restaurant was close to full. Chris is not a fancy place, but there is table service and the waitress was friendly and patient as we could not decide what we wanted to eat. Everything looked good. We must have been hungry because we ordered too much food. Donna had been there before and she recommended the gumbo and potato salad which we all tried. The gumbo had a medium roux base and was chocked full of shrimp, oysters and crabmeat. It was well seasoned without being spicy hot. In my opinion, a restaurant that tries to be “Cajun” by loading up on the cayenne pepper is not a very good way to represent the cuisine. Chris did not do this. The flavor of the seafood stood on its own in the roux. Perfect Gumbo!! The potato salad was creamy and contained celery, pickle relish and yellow mustard along with obligatory mayonnaise dressing. Yum! The potato salad and gumbo combination is a Cajun staple. Some people like to spoon the salad right into the full bowl of gumbo and eat them together. I prefer mine separate, but the texture and flavors are great together. Between the three of us we also sampled a couple of Poboys. Ham with Swiss and turkey did not disappoint. The meats and cheeses were tasty, but it was the bread that was the star of the sandwiches. It had a crispy crust, but a soft inside. 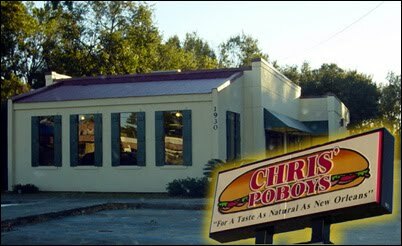 Pure Poboy heaven can be found at Chris. If I had been on my own, I wouldn’t have selected Chris for our lady lunch, because of its unpretentious façade and casual nature, but Donna’s past experience there allowed us to partake of this delightful spot! There are three locations in Lafayette, but we went to the one on West Pinhook. I will go back there as it was inexpensive and authentic. http://www.chrispoboys.com/ is the website. Your mouth will water when you view the online menu posted there. After our lunch we walked next door to Poupart’s Bakery. 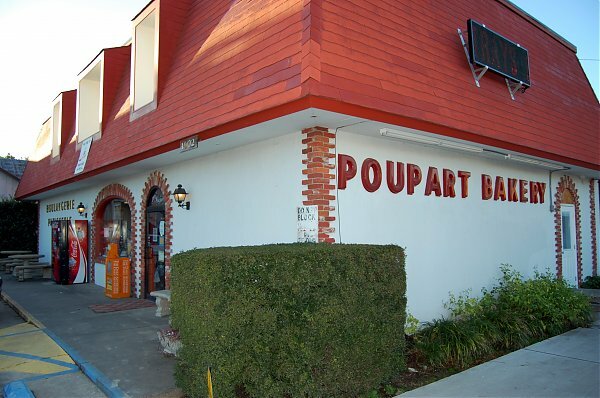 Poupart has been baking bread in Lafayette since 1967 and touts that it is the only authentic French bakery in Acadiana. We were very impressed by the cases of pastries, cakes and pies. I almost tripped over something in the parking lot. I looked down to find a wad of money on the pavement. I looked around and saw no one who could have dropped it, so decided to keep it. It was enough for us each to have a treat from the pastry cases and a loaf of basil bread to take home. I felt guilty that I was enjoying the sweets with someone else’s money, but also fortunate for the windfall. We could have eaten lunch at Pouparts. We found out that they offer a plate lunch daily. The menus are posted on their website. http://www.poupartsbakery.com/ has many snapshots of the bakery specialties. Again, prepare for some serious mouthwatering viewing if you visit their website. There were some older gentlemen sitting in the bakery enjoying a coffee and they were having a conversation in French. They were probably saying: “Look at those women stuffing themselves with sugar!" We sampled strawberry Napoleons, Cannolis, and an Easter Mouse! The “mouse” was actually a gooey pastry shaped in an oval. It was filled with nougat and iced in a pastel color. It had sugar decorations that made it look like a little mouse. I got the feeling that this treat was unique to Pouparts. Talk about sugar overload! The shopping took second chair to the eating of the day, but we did manage a little retail therapy before heading home. It was a perfect day spent with some of my favorite folks. As we drove home over the Atchafalaya Spillway we discussed our next trip. Look for a report of that trip in a future story.